Yemen's Houthi rebels have claimed responsibility for downing Moroccan F16 fighter that Saudi-led coalition earlier declared missing. A Houthi TV channel broadcast a video that Iran-allied fighters said showed the wreckage of an F-16 plane. "The air defence of the tribes shot down a warplane over Wadi Nushur, in Saada," Houthi news channel Al Maseera said. The channel broadcasted pictures showing local tribesmen celebrating a victory near the F-16 wreckage. The Iran-backed Shia group claimed the Moroccan jet was downed by a surface-to-air missile in Wadi Nashour area in the northwestern province of Saada, a Houthi stronghold near the border with Saudi Arabia, while conducting airstrikes Sunday. 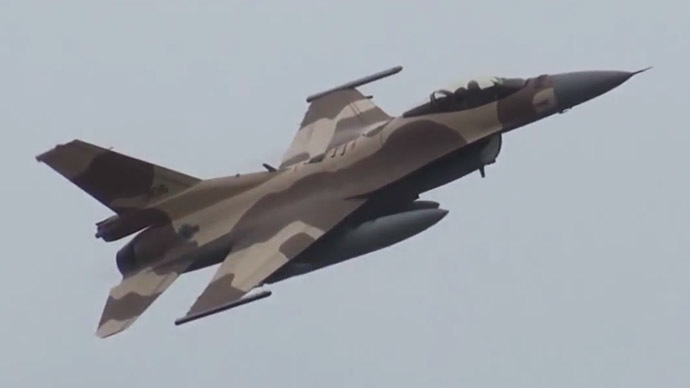 Moroccan Royal Armed Forces, representing one of eight Arab states to have joined Saudi Arabia’s coalition, said that their F-16 fighter jet that took part in the Saudi-led bombing campaign in Yemen had gone missing. "One of the F-16s of the Royal Armed Force put at the disposal of the coalition led by Saudi Arabia to restore legitimacy in Yemen went missing on Sunday at 6pm local time," the statement said. The Royal Armed Force, however, would not confirm the video aired by Al Maseera. "It is definitely inside Yemen and it is a single pilot on board," the Saudi official told AFP, speaking on condition of anonymity. Saudi Arabia’s Ministry of Defense later announced that the jet had been located. It added that pilot’s condition was unknown. The disappearance of the F-16 could jeopardize a five-day humanitarian truce proposed by Saudi Arabia starting Tuesday. While the Houthis accepted the ceasefire, Colonel Sharaf Luqman said any violation of the ceasefire would prompt a military response. The Saudi-led operation against Houthi militia forces has entered its seventh week. Nearly 1,250 people have been killed, and at least 5,044 people injured between March 19 and April 27, the World Health Organization said Friday. Local estimates on the ground are much higher. Houthi rebels took control of the Yemeni capital, Sanaa, in September 2014, in a move that forced Sunni President Abd-Rabbu Mansour Hadi to flee to Saudi Arabia.